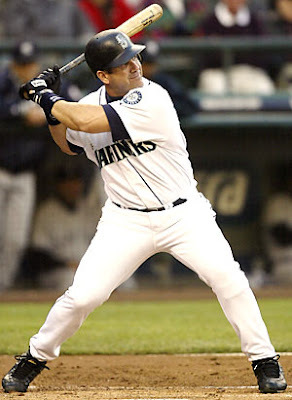 Home » 2010 Hall of Fame , Designated Hitter , DH , Edgar Martinez , Hall of Fame , Jim Rice , Joe Gordon , Paul Molitor , Rickey Henderson » Will 2010 bring the election of the next designated hitter to the Hall of Fame? Will 2010 bring the election of the next designated hitter to the Hall of Fame? Yesterday's induction of Joe Gordon, Rickey Henderson and Jim Rice into the Baseball Hall of Fame now gives us almost an entire year to contemplate the candidacy of the new crop of players eligible for the Baseball Hall of Fame in 2010. The list of includes (in alphabetical order): Roberto Alomar, Kevin Appier, Andy Ashby, Ellis Burks, Andres Galarraga, Pat Hentgen, Mike Jackson, Eric Karros, Ray Lankford, Barry Larkin, Edgar Martinez, Fred McGriff, Shane Reynolds, Robin Ventura, and Todd Zeile. A name that jumps off of this list, certain to be a hot topic of debate is Edgar Martinez. Martinez spent his last 10 seasons exclusively as a designated hitter, only appearing in 33 games in the field from 1995-2004. Paul Molitor is the only player in the Hall of Fame who spent nearly half of his career as a designated hitter. However, a quick comparison of Martinez to Molitor shows that Molitor spent substantially less time as a DH, playing 900 more games in the field. Molitor is also 9th all-time in hits with 3,319, over 1,000 more than Martinez. Offensively, Martinez is only one of 15 players that has a lifetime BA of over .300, a lifetime OBP of over .400, and a lifetime SLG of over .500. 13 of the 15 players are in the Hall of Fame. The two that aren't are Joe Jackson and Martinez. While Martinez was one of the most feared hitters of the mid-late 1990's, are his offensive numbers dominant enough to overshadow the fact that he didn't pick up a glove for his last 10 seasons in the Majors? When fans and voters discuss the merits of the forthcoming Hall of Fame candidates, how significant will defensive play be factored into the equation? If you only have to go up there and hit 4 times a game without the grind of playing in the field 9 innings, do you have an unfair advantage over the players who are expending their energy on both offense and defense? How far ahead offensively does one need to be for public consensus to deem them Hall of Fame worthy if you are primarily a DH? These are the questions will be investigating as Edgar Martinez begins his campaign for the Hall of Fame. There is already a website dedicated to promoting his candidacy for the Hall of Fame. You can read all about it, here.